What kind of person would spend hard-earned money to break stuff? All sorts, actually. At Sarah's Smash Shack in downtown San Diego, grandparents arrive with children as eager to wreak havoc as any bachelor party reveler or jilted spouse. Co-founder Sarah Lavely is not surprised. A former veterinarian, she found herself in the midst of a difficult divorce two years ago. The frustration almost overwhelmed her. "I felt like I had the rug pulled out from under me," Lavely says. "I felt as if I was being forced to dissolve the marriage. I felt betrayed and humiliated." She felt like throwing something. From that urge a business was born. Sarah's Smash Shack, located in a business building, features two rooms where plates and glasses and bottled-up emotions get broken. Customers are encouraged to bring their own music and really lose themselves in the moment. The operation hosts corporate parties and gets clientele in and out for about $20. 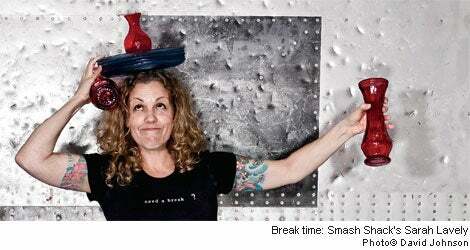 It even recycles: At least 70 San Diego art projects have been created from Smash Shack aftermath. With its stylized "Break Rooms," the Smash Shack seems built to capitalize on recession-era tensions. Yet Lavely insists her timing is just a happy accident. "I've been working on this for 35 years," she says. "I've been breaking things since I was a little girl." As for the anger that led her to build the Smash Shack in the first place, "I've completely moved on," she says. But frustration is eternal. Plans call for two more Southern California Smash Shacks within the year--if things go poorly enough.